On my final night in Cincinnati, I sought out a nice place for my family to enjoy dinner out all together before we parted ways. Because it was my birthday, I really wanted to find someplace special to dine. 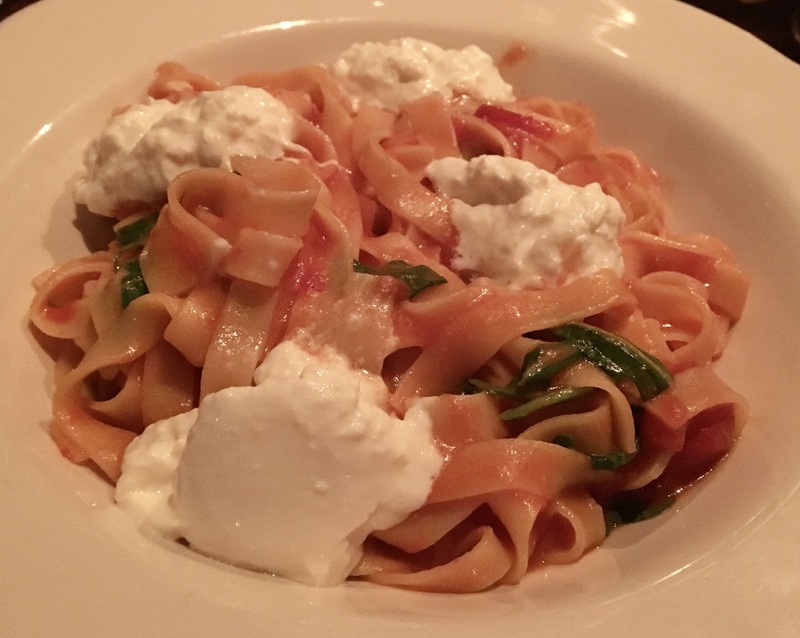 As I scoured restaurants in and around the city, I came across Sotto, which drew me in with accolades from Find Me Gluten-Free and local food critics alike. Italian food typically is not the most gluten-friendly of world cuisines, but Sotto's menu focuses on crafting nuanced, delicious dishes without too much of a reliance on breads and pastas. Even where pasta is present, gluten-free pasta made in house makes for an easy swap. As it happens, Sotto is a member of the Boca restaurant group, which manages nearby restaurants Boca and Nada, the latter of which I also visited on my visit to Cincinnati (review link). Although I did not know it when I made reservations, it was cool to nab a table at two of Cincinnati's most lauded restaurants. After a great experience at Nada, I couldn't help but put my expectations pretty high for Sotto. As Sotto is Italian for "below," the restaurant is found in an unassuming nook in Cincinnati's downtown. Once you enter, the ambiance really kicks in, providing an old world feel from the minimal decor of exposed brick and wood and candles on every table. Definitely subterranean in feel, I loved the cool darkness of the restaurant, which definitely transported you to another place far away from the city. When considering atmosphere, my only complaint was that the music was a little loud, making it hard to hold a conversation with my family and hear the wait staff. 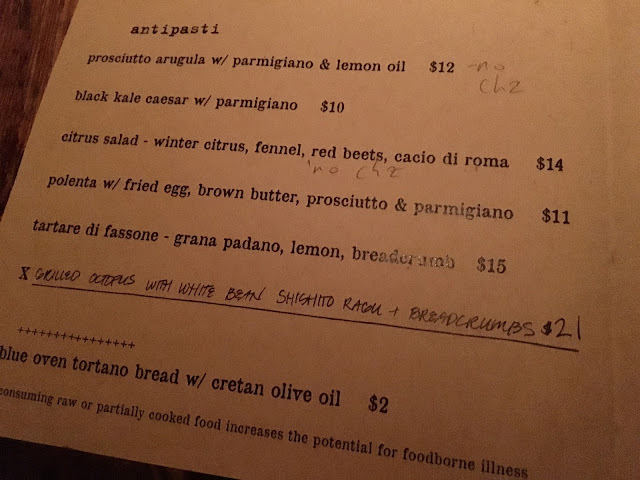 When our waiter came to table, he already knew of my gluten and dairy restrictions from reading my Open Table reservation, something that has only happened once or twice before in my time dining out with food restrictions. Before making any guidance as to what would be safe, he spoke with the chef to see what my options might be. When an allergy order is placed, there is protocol in the kitchen to alert the chef to allergies- just be sure to bring them up with your server beforehand. 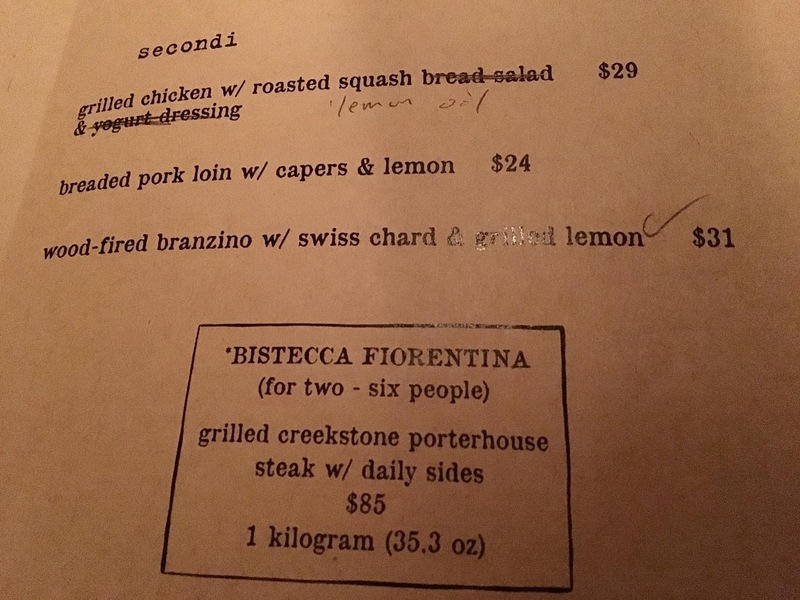 Sotto recommends ordering either individually or family-style. My family opted for the former rather than the latter. 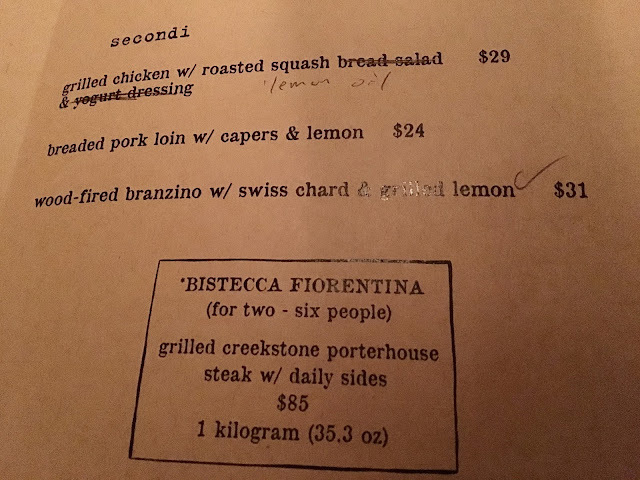 For individual portions, it is recommended to select a dish from the first two menu sections (below) and a dish from the final two (also below) for a perfect amount of food. 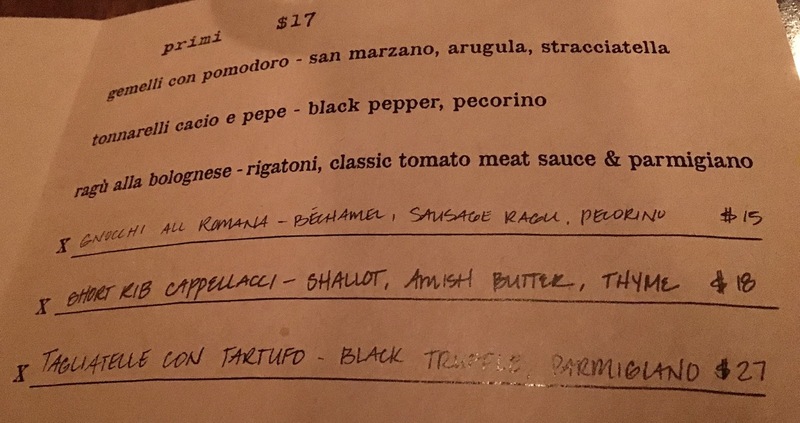 When it comes to the first part of the menu, the house-cured salumi is the only safe bet. After all, Bruschetta is a dish based on gluten-laden bread. When it comes to antipasti, the only safe options where the prosciutto and citrus salad- both sans cheese. The pasta section of the menu is where many gluten-free eaters will find their happy place. 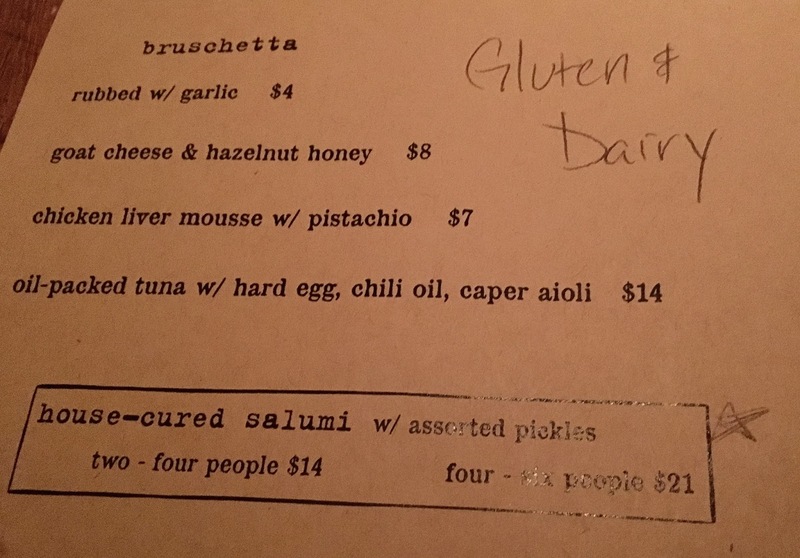 All but the gnocchi (and I believe one other dish) can be made gluten-free. In researching Sotto, I had a miscommunication with the restaurant, as I was lead to believe that the pastas could also be made dairy-free. Unfortunately, this is not the case, as the pasta dough is made with dairy. I was disappointed by this revelation, and looked elsewhere to see what other options would be on the table. The final portion of the menu is the entrees, of which two out of the three are safe (the pork loin is not). The grilled chicken is made gluten and dairy-free when prepared with lemon oil and the branzino is safe as is. Needing to veer away from the pasta, I decided to go for the branzino entree. This sea bass is a white fish, and was prepared simply on a wood fired grill. Tender and seasoned perfectly, the fish clearly was the main player, letting the simplicity of the filet shine through. A squeeze of lemon added a flash of tart citrus flavor. The fish sat atop a bed of swiss chard, which was sautéed simply. It didn't make a huge impression on me, but it was still good nonetheless. 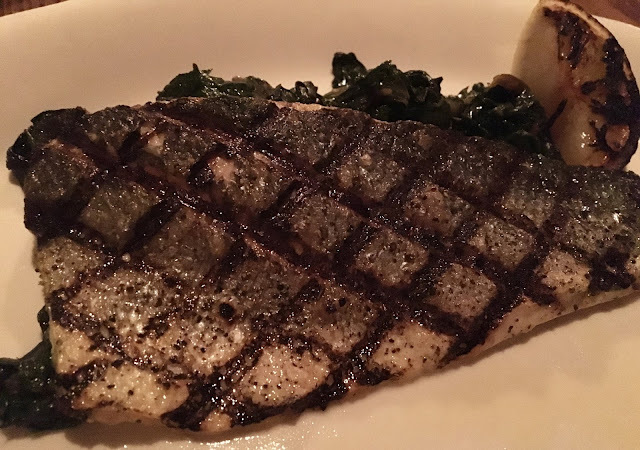 Although I had my sights set on the pasta, the branzino was actually the dish I was craving that evening, as I wanted a simple dish after a sugar and carb-filled day at the Gluten-Free for Cincinnati Expo. My mom ended up ordering the gluten-free pasta with her gemelli con pomodoro, as she is trying to minimize her gluten intake. She liked the pasta and the dish she ordered, but a mix up in the kitchen caused her to send her dish back as it initially came out as a garlic-free order, not gluten-free. Because of the miscommunication about the pasta, my waiter was really apologetic and wanted to make it right. 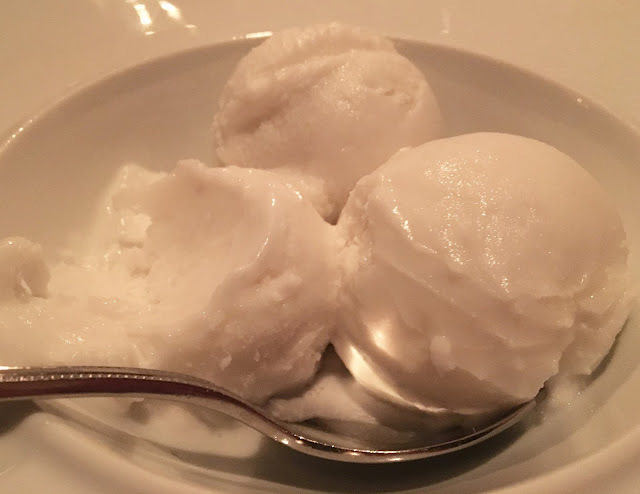 Although none of the desserts were both gluten and dairy-free, the manager went upstairs to Boca's kitchen to pull coconut sorbet for me as a special treat. The cool, creamy dessert was delicious, but at that point I was really not wanting anything sugary so passed it around the table so my family could enjoy it. I think my sky high expectations clouded my experience at Sotto. Although my food was good and the atmosphere was really unique, I liked but did not love the restaurant. Maybe it was because I was exhausted after a busy day, maybe something was off that night- I don't know. Either way, I don't think I'll be hurrying back to the restaurant. Between the two, Nada impressed me far more, and takes my pick for my favorite of the two. I must give a shout out to the staff, who were clearly knowledgable of the menu and helped guide my family around it. They were willing to seek answers to my questions, and clarify confusion, which is not always the case when dining out with dietary restrictions. Accessibility: Wheelchair accessible, elevator located in nearby restaurant Boca. My son used to work there. My wife and I are dairy/gluten free. When he asked the owner/chef what we could eat, his response was "who eats like that?"... Not a sympathetic ear toward those that have to eat this way and it shows. I was disappointed because I heard great things about Sotto... to this day its the most underwhelming experience I have had when dining out GF.